Since ExPop is used to grab the attention of people who are about to leave your website, I searched my feed reader for articles contain the word "attention", and came up with one from Copyblogger -- that'll be the one to Riff on this week. Read this post by Danny Iny, which appeared as a guest post on Copyblogger. Write a Blog Riff on it -- ie. quote a brief section of it on your blog, and publish a post based on the quote (tip don't try to cover the whole article, especially with an article like this that covers a lot of different things -- pick one idea and "riff" on it). Be sure to give proper credit for the quote -- ie. link to Danny's post from yours. Don't just regurgitate or rephrase what Danny said -- your post should be primarily composed of your own original thoughts, research, etc. Once all the entries are in, I'll read them all and announce a winner here on the blog, and I'll give them their free copy of ExPop. A quick request before I sign off -- please spread the word about the contest! Use those buttons over to the left. Tweet it. Link to it from Facebook. Post it on Google+. Tell your subscribers. 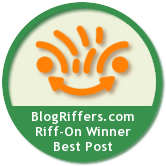 The more people we get involved in Blog Riffing, the stronger -- and more fun -- our community will become.